Germany to get free offshore wind! Wait, what? The recent news of alleged “subsidy-free” offshore wind power in Germany has drawn a lot of international attention. Craig Morris spoke with Andreas Wagner, head of Germany’s Offshore Wind Foundation, not only about the reasons, which have been well reported, but about some downsides, which have not. Germany has just completed its first round of tenders for offshore wind, and the outcome came as a shock: one winning bid asked for a bonus of 6.0 cents/kWh on top of the wholesale rate, while the other three went for zero – meaning that those projects will make do with whatever wholesale power price is available (unless a power purchase agreement is signed, for which a buyer would need to be found). The projects will not go online until possibly 2025, by which time offshore turbines will be different beasts. Denmark’s Dong Energy, which won three of the bids worth a total of 590 MW, speaks of “probably 13-15 MW” turbines by 2024, compared to 8 MW today (press release). Bigger turbines mean fewer platforms are needed, which should lower costs. And other projects by Dong and German utility EnBW, which bagged a whopping 900 MW, are nearby, so some infrastructure (such as for O&M) can be shared. Finally, the New York Times points out that both firms can back out by 2021 if prices don’t develop as planned. “That’s where things get sticky,” says Andreas Wagner. “There is a penalty to pay if the projects aren’t built.” It’s not as easy as the Times’ wording: “the company can walk away from the deal if trends do not go its way.” Rather, Wagner says that the bidders have already paid 100 euros per kW as a financial security. That money will be foregone if a company backs out. In the case of Dong, 110 MW is to be built for a bonus of six cents above the wholesale price – and 480 MW with no bonus at all. If the company backs out of 480 MW, it will forgo the 48 million already transferred. It’s not chump change even for a giant like Dong, which posted some 2.5 billion euros in operating income in 2015. That security payment alone represents around 2% of total income for that year. The only “compensation” these losing bidders receive is a last-call option, meaning they may be able to build if a winning bidder pulls out. But this option can be only applied in the next phase of the auction scheme, similar to the one applied in Denmark and the Netherlands. It only starts in 2021, with annual auctions in the range of 700-900 MW. The first projects will be commissioned after 2025. “But it would have been better if sunk costs were actually repaid, at least in part,” Wagner argues. Otherwise, the number of firms who can participate in bids will shrink. The principle of auctions is market concentration. Of course, Wagner is pleased about the new low prices. Up to now, Germany has paid 10-12 cents per kWh. But are the firms right to expect wholesale rates to rise? Yes – we just don’t know by how much. 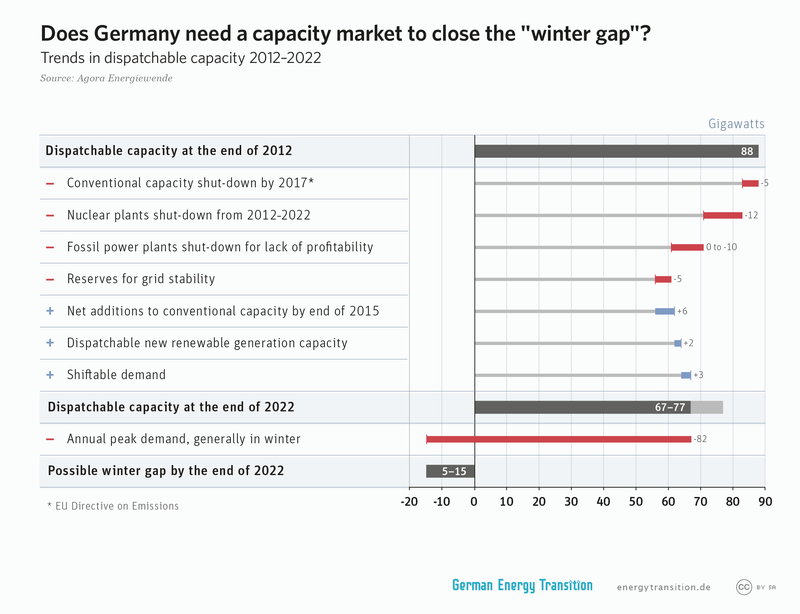 By 2023, Germany will have no nuclear, with the remaining eight reactors having closed. No coal is in the pipeline with one possible exception. Gas turbines will start setting spot prices more, so expect six cents to be the norm. “That’s the same price level we had just six years ago,” Wagner points out. That level is not so different than recent price breakthrough in the Netherlands, also by Dong. Completion of the nuclear phaseout in 2022 could leave a shortfall in dispatchable capacity. Wholesale power prices could rise as a result. The real question is whether any price above zero (meaning no bonus on top of the wholesale price – but not “free” electricity) can even win a bid in future German offshore wind auctions. The next one is in 2018. Wagner says the specifics of this round mean that bids in future rounds might all request some bonus. “We may not have reached a point of no subsidies yet,” Wagner says. His main concern is that not enough can be built under the auctions. In 2021 and 2022, it’s only 500 MW. In the years following, it’s 700 MW per year. “A greater volume would help Germany reach its climate goals and reduce the number of firms with sunk costs from losing bids in one go,” Wagner proposes. Indeed, practically everyone – from the state government in Lower Saxony (in German) to German offshore wind organisations and WindEurope, to journalist Ralf Köpke (in German) are telling the government the same thing: now that the prices are down, there is no justification not to build more offshore wind. That new,larger wind generators will be available(bankable!) is not seen yet, it takes years to get a new wind generator into actual production by the hundred pieces. Planning, testing, insuring, producing and installing. The largest which can be bought from the shelf is about 8 GW, I think Mitsubishi has one 9 GW generator in the testing phase. There is no demand for baseload futures 2023 at around € 31.-/MWh, the speculators fear that they’ll lose out if buying at this price. If someone was seriously expecting a price increase to € 60.-/MWh than a deal would have been made. But as the power exchange confirms: there is no demand, no “Volume exchange” at 31.-/MWh – since a half year the offer isn’t touched. Nice post Heinbloed – Vestas/MHI has “grown” its 8MW platform to 9MW and MHI (Mitsubishi Heavy Industries – is the 50% partner of Vestas for off-shore WTs. I’m guessing that Dong & Vestas are “close” so perhaps the 15MW machines are in the pipeline. It is brave man that predicts wholesale price out to 2023 – but I’m guessing that the nuke shutdown and some pressure on coal stations will move things along. oh & another comment – why don’t the Germans do what the Dutch & Danes do – auction shovel ready projects? Are the bidders really expecting to sell into the spot wholesale market rather than PPAs? They have plenty of time to find customers. For a steel mill, say, they would need to offer gas backup, but that can be built quickly or bought in. If the bids really are based on wholesale, the bidders must be betting that the negative prices created by must-run (or nearly so) coal, lignite and nuclear plants will have disappeared by the time the wind farms are completed. Surplus wind and solar capacity does not create negative prices, it just gets switched off at zero.